Best. Summer. Ever. With these bold words (and punctuation! ), straight from some cool adman's desk, Toronto advertises its current program of activities. 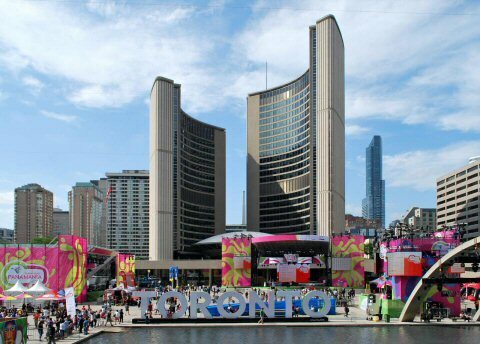 The Ontario metropolis has put on a series of musical performances, street art, fireworks, culinary activities and so on to go along with the 2015 Pan Am Games that it hosts. How quaint. It may well be the best summer ever. For Toronto. In Montréal, of course, that's every summer. One of the consequences of the high-tax, big government policies of Québec is the largest per-capita spending on arts and culture in Canada. And that materializes itself in the summer-long parade of events which set the city abuzz. The Jazz Festival is the world's largest, and its reputation reaches far beyond the province's borders. Indeed, it went as far as London, where last year the Economist took note and highlighted a side of the event that had not occurred to me: Apparently, this festival alone generates about $75M in revenues for the local tourism industry. Add to that the happenings before and after it, and you end up with a nice boost to the city's economy. Given its otherwise uninspiring economic performance, Montréal can use the leg-up, and it is encouraging to see that the "festival season" keeps expanding. This year, I have attended both the C2MTL creative shindig and a rowdy Montréal Complètement Cirque performance. And that's before Just For Laughs brings one of my favorite actors on to the local stage. To make all of this a success, it doesn't just take lots of tax money, but a thriving local arts scene and a population willing to engage. It is the last bit, apparently, that Toronto is struggling with. When we visited the Queen City last weekend, its inhabitants seemed notably indifferent towards their supposedly sensational summer. The Pan Am organizers rushed to give out free tickets to events, so that at least some spectators would show up for the competitions. Free concerts drew modest crowds. As Montréalers, of course we would not want to be smug about Toronto's estival tribulations. Magnanimous as we are, we encourage T.O. to seek an extra boost to the provincial bottom line this summer. Staging large-scale sporting events is an excellent way of doing that - as Montréalers had to find out back in 1976.